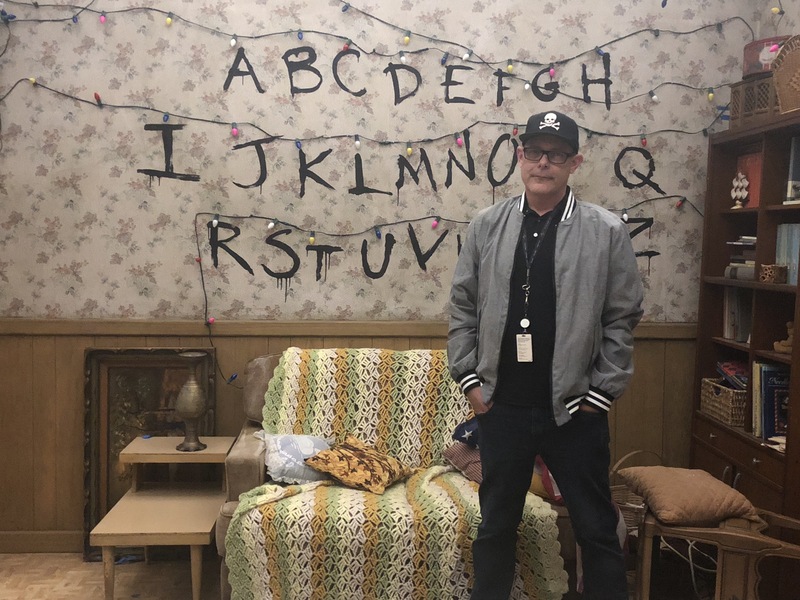 This year at Halloween Horror Nights, the creative minds that bring your favorite horror films to life are heading into the upside down with Netflix’s Hit Series Stranger Things! 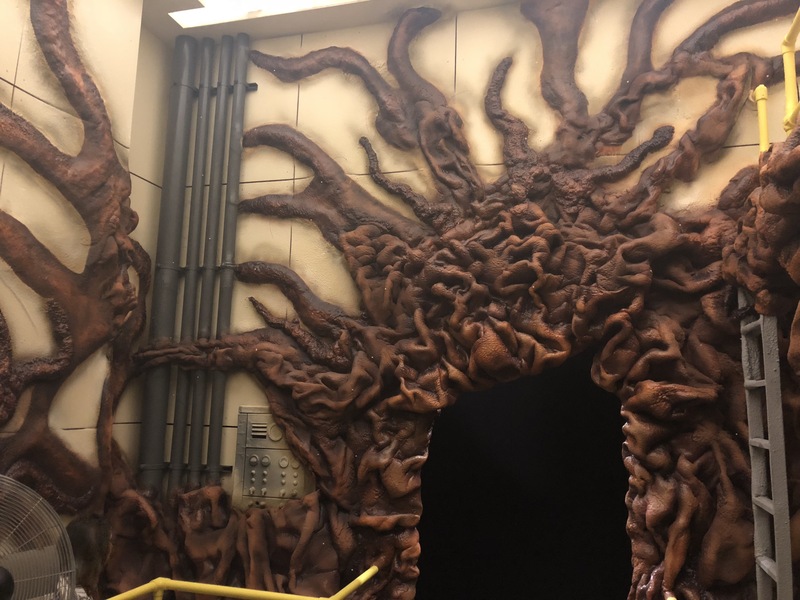 We were lucky enough to be invited to Soundstage 29 to see the current progress being made on this highly anticipated attraction for HHN. Unfortunately, we can’t share everything with you (what would be the fun in that) so you’ll have to attend HHN to see everything in person. But we’re able to give you a small taste of what the maze will look like! Fortunately, we were able to record our tour as well! Above you can hear the tour we were given by John Murdy, but I did cut specific portions out to keep some surprises secret. As with every other HHN maze, the attention to detail is second to none. As you step foot inside Stranger Things, you will be immediately transported to Hawkins and pick up where Will was kidnapped by the Demogorgon! Not only that, but you will encounter some of the most famous scenes from Season 1 of the show. 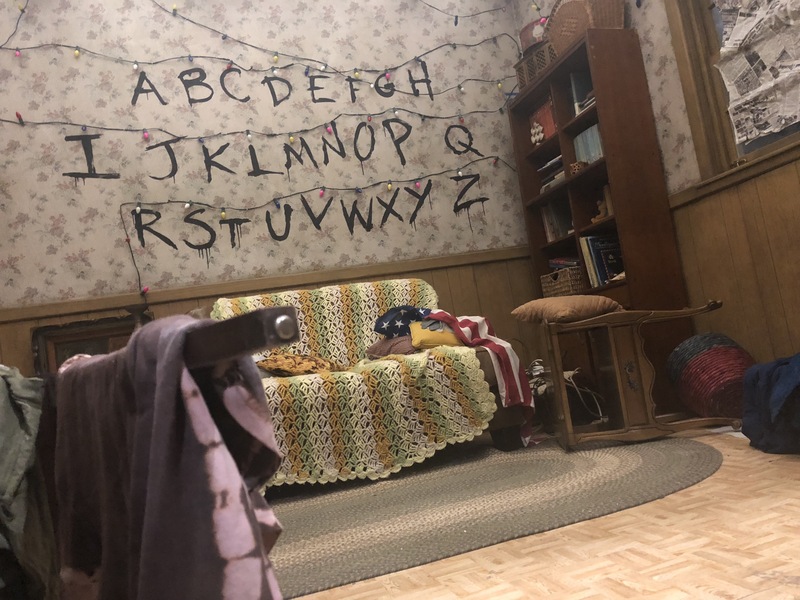 John mentioned the audio within this scene was a 5.1 surround sound set up to help immerse guests into the world of Stranger Things immediately. Sound always plays a major role within these haunted attractions, but even more so for Stranger Things. One major hurdle John mentioned was how to deal with the kids themselves. “When you’re working with actors and the average age is probably around 20, doesn’t really work to put a wig on someone and go ‘YOU’RE DUSTIN!’ It just doesn’t look right. It looks off.” John said. By utilizing dialogue from the show, the kids are better represented and also equally help propel the story through the maze. As fans of HHN and Stranger Things, it was extremely exciting to see the Christmas light scene brought to life! 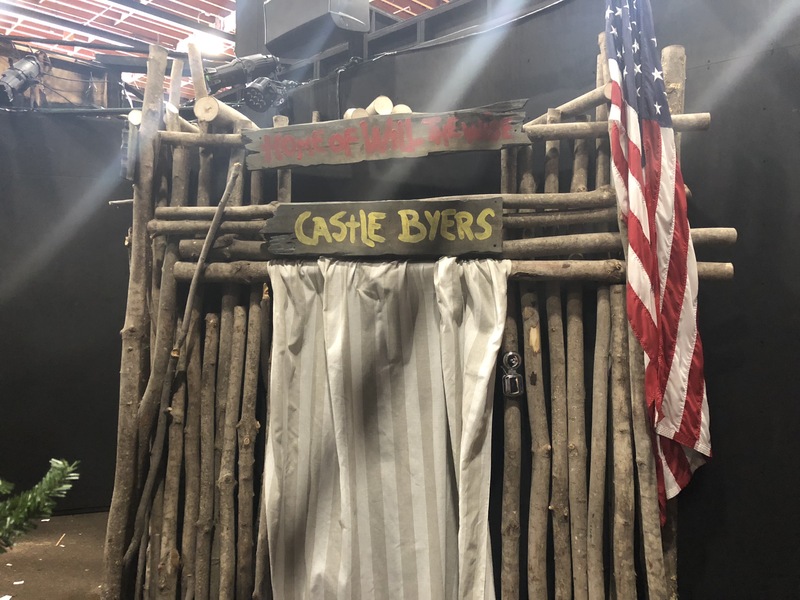 From a scenic design standpoint, the whole scene (including many others) had to be decorated with time specific furniture, wall paper and a myriad of props. It’s this type of attention to detail that truly sets HHN above the rest. “When I did my lighting walk…I went ‘So these all have to individually chases…these are all plugged in. TOGETHER! Like you would plug in Christmas Tree lights.’ That didn’t work. We need individual control of every light in this scene…to move you through the scene like the lights do on the show.” John said when looking at the scene with us. Funny how one seemingly simplistic scene can become much more complicated. As you pass by Castle Byers and many other iconic scenes from the show, you approach Hawkins Lab. This is when you truly get a sense of the space John is working with. It’s not often that mazes are placed within sound stages. John mentioned the challenges in coordinating a sound stage for HHN since it’s all located on a working studio backlot. 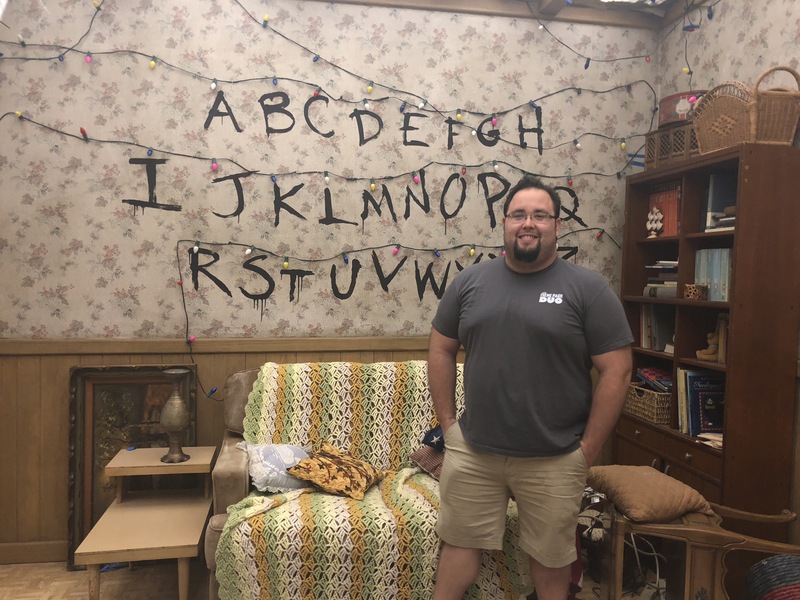 But he was lucky enough to get one for Stranger Things and he was able to play with the size of the sets more-so in this location than any of the others. Not necessarily in the size of the rooms, but more in the height of the sets.”Now we get to use the height of the sound stage to our advantage. So, everything starts to get a lot taller.” John mentioned. As you approach Hawkins Lab, a FULL SIZE white van sits in front of a massive facade that is Hawkins Lab. This is where you will meet people in hazmat suits chasing you into the lab. It is important to keep in mind that this is not the only scene that utilizes the height of the sound stage. One of the scenes that we are most excited to see come to life is the upside down itself. Currently it was still in construction fazes and wasn’t quiet ready yet. But this scene is going to be something to behold when at the event. It sounds like John and Chris are utilizing multiple special effects techniques and many other visual tricks to help guests feel like they’ve entered the upside down. One of the biggest challenges for John and his team was bringing the infamous Demogorgon to life every single night of the event. He mentioned how he normally would get molds of creatures for many of his different projects, but this one was a bit more difficult. The show would normally rely on CGI effects to cover up different pieces of the monster. So they had to design a costume that works best for their needs. Even right before we arrived at the maze, John had just had someone in the costume testing out the different scenes to make sure the holes are big enough for the actor wearing the costume to fit through. Just one of many different details one doesn’t think of when designing mazes. We are so unbelievably excited to experience Stranger Things with lighting, actors, and special effects! Even though we walked through it with the lights on, it will be a totally different experience at HHN. As excited as you might be for Stranger Things, remember that HHN has a MASSIVE line up of incredibly exciting IP’s for this years event. Halloween Horror Nights in Hollywood starts Friday, September 14th and it will run select nights through November 3rd.